We went early so there weren't too many people. It was great -- a lot of fun, without a lot of athletic ability needed. A wonderful opportunity to try bouldering - thank you! Super friendly staff and nice facility- was really happy I went! it was nice to find a cool activity tucked away, I never knew rockspot was in that location. Michelle who helped me was so awesome, super knowlegable, down to earth and encouraging. Thanks for giving me an extension! Definitely considering getting a membership :) Enjoyed it for sure! I've been to one other rock climbing place, but they didn't have an auto belay like Rock Spot. Prices a little steep though. First time climbing and had the best time! The staff did an excellent job of instructing and giving a quick hands on tutorial. Will certainly be going back! The staff was great. It was a challenge. I had a great day of bouldering at Rock Spot! Thank you so much! I am planning on going back more regularly too. 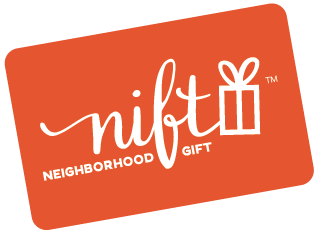 Nift is such a great way for customers to discover new activities, delicious food and stylish clothing! And a great way for businesses to advertise their priducts! So much fun! A great workout, great staff, lots of freedom. I loved the rock climbing idea! Basically every other option was cosmetic or just not something I would be interested in , but the experiential nifts like this are amazing! I will absolutely be going back to the same gym likely with a membership. Continue to enjoy Nift! Excellent gift cards that provide impetus to visit a new business. Several terrific experiences and now regularly supporting local businesses that I would never have known about or supported. Terrific, responsive customer service reps too! Staff is friendly and helpful! Thank you! Friendly fun place. Will go back again! Great, friendly, clean climbing gym! Nift gift certificate was easy to use and rental gears were in good shape. Tim, one of the staff there, were very friendly and good at explaining everything to to my group of first time climbers. Would highly recommend! The staff were all super friendly, and the check in and equipment process was a breeze. There was a ton of variety on the bouldering walls. Overall, such a good experience! Went on a Monday afternoon and we almost had the place to ourselves. Loved rock spot. Been meaning to check it out for a while now, the nift was the motivation I needed. Will go back for sure! I love rock spot. Bought my own rock climbing shoes today actually! Such a great place. Rock spot climbing was such a fun new experience! My husband and I went as a day date and enjoyed every bit of the challenge and adventure! The staff at Rock Spot Climbing is very helpful and friendly, especially for beginners. The Nift gift was also great and easy to use. This was a great place to go try out rock climbing! I had a great time rock climbing with my sister and introducing her to sport! We really enjoyed our experience at Rock Spot. My daughter is hooked so we will be back soon. Rock spot was great! I would never have thought to go there if I hadn't heard about it through Nift. My friend went with me and used his Groupon and i'm looking forward to returning with him while he uses his pass. Very fun and exhausting (in a good way). Lots of activities and elements to try. Staff was very nice and informative. Will definitely come back. Great way to try out a new rock climbing gym. I think I will be back! The staff at the southie Rock Spot really won me over. Super kind from the get go, helped me decide where to start, showed where everything is, even helped me figure out one if the climbs i was having trouble with. So stoked. Will definately go back. THANKS! Great place to spend a Saturday night! Challenging, fun, and well-run. I had never done anything like this and wishbthey told me i needed to use powder on my hand or tell me how to know what wall was easier or more difficult... a fellow climber saw us struggling a d helped us out and made our experience much better! Besides that it was a good experience. We had a great time and Bri was super helpful! The only problem is that not EVERYTHING has safety equipment. Wonderful! We'd been meaning to visit rock spot since it opened and nift gave us the nudge we needed to finally make the trip. Staff was courteous. We were first time climbers and they explained and demonstrated all the safety measures. Facility looks well maintained. Staff was very friendly and helpful. Facility was safe and fun for the kids. This gift was such nice surprise. Thank you so much!